This research aims to produce teaching materials based on science laboratory which is valid, practical, and effective to facilitate the students’ scientific communication skill. The development of teaching material used the R&D model and was implemented in 7th grade of SMP Negeri 1 Ende in the second semester of 2017/2018 by using the Pre-Experimental One-Group Pretest-Posttest Design. The data collection used documentation, observation, test, and quetionnaires. The data analysis techniques used quantitative and qualitative descriptive analysis. The results of this research are:1) Teaching material developed is valid to be used. It consists of Syllabus, Lesson Plan, Student Worksheet and Test of student learning outcomes; 2) The practicality of teaching material is categorized into feasible according to lesson plan implementation, students give a positive responses toward teaching material and the implementation of teaching material; and 3) The teaching material is effective in terms of: (a) Improvement of students’ learning achievement; (b) Improvement of students’ scientific communication skill. Thus, the teaching materials based on science laboratory are valid, practical, and effective to facilitate the students’ scientific communication skill. Adler, R and Rodman, G. (2006). Understanding human communication. New York: Oxford University Press. Bayrak, B. K. (2013). Using Two-Tier Test to Identify Primary Students' Conceptual Understanding and Alternative Conceptions in Acid Base. Mevlana International Journal of Education (MIJE), 3(2), 19-26. Borich, G. D. (1994). Observation skills for effective teaching. New York: MacMillan Publishing Company. Demircioglu G. and Yadigaroglu, M. (2011). The effect of laboratory method on high school students’ understanding of the reaction rate. Western Anatolia Journal of Educational Sciences (WAJES). Dokuz Eylul University Institute, Izmir, Turkey ISSN 1308-8971. Dixon, T. and O’Hara, M. (2013). Communication skills. Educational Development Project. (http://cw.routledge.com) diakses pada 11 februari 2016. Glencoe. (2010). Discovering life skills. USA: Glencoe McGraw-Hill. Hofmann, A. H. (2010). Scientific writing and communication: Papers, proposals, and presentations. UK: Oxford University Press. Ibrahim, M. (2002). Pelatihan terintegrasi berbasis kompetensi: Pengembangan perangkat pembelajaran. Surabaya: Direktorat Sekolah Lanjutan Tingkat Pertama Departemen Pendidikan Nasional. Jufri, W. (2013). 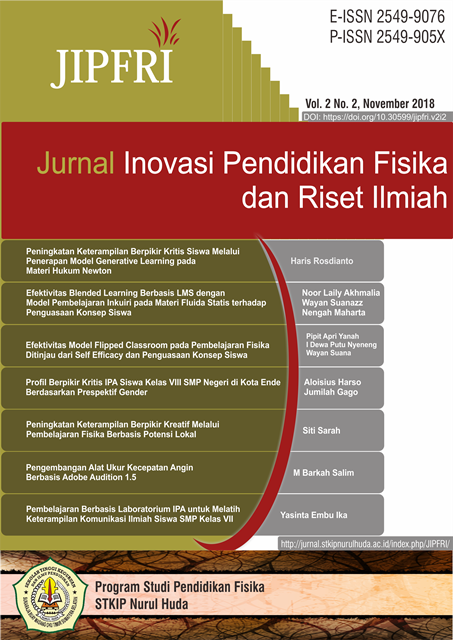 Belajar dan pembelejaran sains. Bandung: Pustaka Reka Cipta. Kemdikbud. (2014). Buku guru ilmu pengetahuan alam SMP/ MTs kelas VII. Jakarta: Pusat Kurikulum dan Perbukuan, Balitbang, Kemdikbud. Nur, M. (2008). Pemotivasian siswa untuk belajar. Surabaya: PSMS Unesa. Nur, M., Wikandari, P.R., dan Sugiarto, B. (2008). Teori-teori pembelajaran kognitif. Surabaya: PSMS Unesa. Nur, M. dan Wikandari, P.R. (2008). Pengajaran berpusat kepada siswa dan pendekatan konstruktivis dalam pengajaran. Surabaya: PSMS Unesa. Permendikbud nomor 81A tahun 2013. Implementasi Kurikulum, lampiran IV. Pedoman Umum Pembelajaran: Depdikbud. Jakarta. Permendikbud nomor 104 tahun 2014. Penilaian Hasil Belajar oleh pendidik pada pendidikan dasar dan pendidikan menengah. Pedoman Umum Pembelajaran. Depdikbud: Jakarta. Squier, C., Renaud, J., & Larsen, S. C. (2006). Integration of a communicating science module into an advanced chemistry laboratory course. Journal of chemical education, 83(7), 1029. http://doi.org/10.1021/ed083p1029. Riduwan. (2010). Skala pengukuran variabel-variabel penelitian. Bandung: Alfabeta. Roosendal, H. E & Geurts, P. A. (1999). Forces and functions in scientific communication: an analysis of their interplay. Educational and Scientific Information Centre (ESIC) Twente University. Safdar, M., Shah, I., Rifat, Q., Afzal, T., Iqbal, A., Malik, R. H., and Wing, C. (2014). Pre-labs as advance organizers to facilitate meaningful learning in the physical science laboratory. Middle Eastern & African Journal of Educational Research. Issue 7. Schulz, B. (2008). The importance of soft skills: education beyond academic knowledge. Journal of Language and Communication. Singer, S., Hilton, M., and Schweingruber, H. (2006). America’s lab report: investigation in high school science. Washington, D.C.: The National Academy Press. Sisovic, D., and Bojovic, S. (2000). Approaching the concepts of acids and bases by cooperative learning. Chemistry Education: Research and Practice. 1(2), 263-275. https://doi.org/10.1039/A9RP90027F. Subiyanto. (1988). Pendidikan ilmu pengetahuan alam. Jakarta: PPLPTK. Trilling, B and Fadel, C. (2009). 21stCentury skills: Learning for life in our times. USA: Jossey-Bass. Zaman, T. U., Bhatti, R. U., & Ghias, F. (2012). Effectiveness Of Pre-Labs At Secondary School Level Chemistry Lab. Pakistan Journal of Science, 64(1), 16-19.